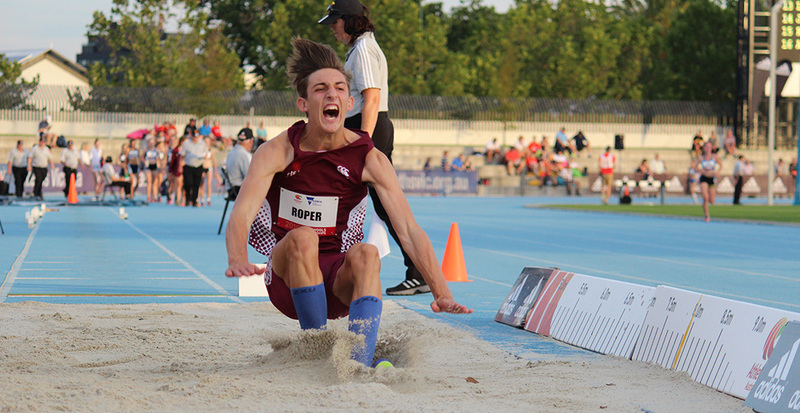 IAAF World Youth Championships silver medallist Darcy Roper (Qld) has won the first of two head-to-head battles with up and coming talent Jack Hale (Tas) at the Australian All Schools Championships in Melbourne (Vic). Taking to the runway for the boy’s under 18 long jump, Roper soared to 7.66m (w: +1.1) with his opening leap to ensure his place at the top of the dais, as David Chen (NSW) won silver (7.28m) to leave Hale rounding out the top-three (Tas, 7.00m). Battling swirling conditions that saw readings vary between illegal head and tail winds, Roper was thrilled to come away with a qualifying performance for the IAAF World Junior Championships next year with his one recorded performance from four jumps. “The qualifier was simple enough, but I have to get my run-up right, stay on the white and avoid the fouls to make the result a bit better next time. The wind was fluctuating a fair bit and I tried my best to wait and see if it would calm down to jump, but the gaps weren’t to be,” Roper said. Roper and Hale will now turn their attention to the boy’s under 18 100m, where they will start alongside Commonwealth Youth Games representative Lachlan McDermott (WA). Hale will start as favourite as both the national record holder and national champion for his age group. “It’s great to get out there and go up against people like Jack. It’s nice to come down here to catch-up with people that I’ve had the chance to tour with through Athletics Australia,” Roper said. In the girl’s event, it was Grace Brennan (ACT) who won gold. Improving on her personal best by 35 centimetres, the 17-year-old soared 5.80m (w: +1.0) in the fourth round to ensure her place atop of the podium. The silver medal was won by Alexandra Petersen (NSW, 5.75m), as Billie Arch (Vic, 5.69m) won bronze. On the track, it was Lorcan Redmond (NSW) and Abbey Rockliff (NSW) that delivered, with meet record performances in the boy’s and girl’s under 16 3000m respectively. Redmond was unrivalled in his race, clocking 8:39.56 to cross first by more than ten seconds as Duncan Miller (ACT, 8:52.08) won silver and Chekole Getenet (Qld, 8:55.68) bronze. In the next race, Rockliff led from the outset to and never looked back, crossing the line in 9:43.36. She was joined on the dais by Melany Smart (WA, 9:43.36) and Ebony Webb (Tas, 9:59.77). Rounding out the highlights on day one of the Australian All Schools Championships was Julie Charlton (NSW), who won two medals in less than two hours in para-athletics events. The gold medallist in the girl’s under 18 800m with a time of 3:08.87, the 17-year-old, who competes in a wheelchair as a T54 class athlete, went on to win silver in shot put with a throw of 5.74m. Attention now shifts to day two of the Australian All Schools Championships tomorrow, before the Zatopek:10 that same evening. At the Zatopek:10, Australia’s best distance runners will duel for the national 10,000m title, with champions to be declared winners of the Ron Clarke Medal. The men’s and women’s race double as the nomination trial for the Rio 2016 Olympic Games, with victory in times quicker than the qualifying ensuring automatic nomination for selection to the Australian Olympic Team.